GO check out all the fun prompts from week 2. This top came from a boutique titled Lana's in a beach town near by. My mom and I had a ball trying on all their cute and unique clothing. This, along with a couple other items came home with me. I was so excited because I had just gotten these frayed hem capri jeggings from Target and this top was perfect to pair with then. My flower topped wedges were the perfect color along with a new leather tassel necklace from etsy. The Brand is "It Girl" and you may be able to find some of the line's items online. I know I want MORE!! It is so well made and isn't the tassel-y fringe hem to die for!! Of course I needed a little fringe purse with it and love this one from Old Navy. 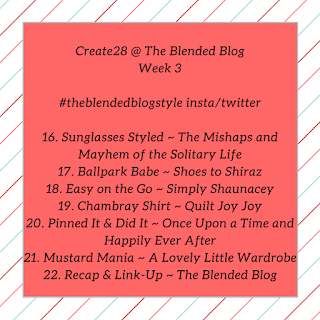 Link up your goodness today so I can stalk your style. Ha Ha! Such a cute top and those wedges are the perfect accessory! You look amazing! What a pretty top!! This outfit looks gorgeous on you! Your top is so cute and fun! Love the detailing! I'm also loving your frayed hem jeans! This top is fabulous! I can see why it had to be yours. I love all the details on it. And your peep toe wedges are perfect with it! Just perfect summer boho chic! OMG .. that top! So meeeee! Hee ....looks amazing on you, Andrea! Adorable look. Hope you're having a fabulous week! What a fun top, Andrea! The tassel details are just the cutest and it looks so good with the distressed skinny jeans and the flower wedges! Love it! I LOVE that top! It's so much fun and I love all the bright colors! You look easy breezy and gorgeous as always! You always pick the cutest things! I would have never had the guts to even try it on. The funny thing is I was wandering Target yesterday and thinking to myself, I wish Andrea was here with me so she could make me try some things on. I am terrible at shopping alone! That is such a fun top! I can see why you fell hard for it. Perfect with your distressed denim and fringe bag. That fringe top is so fab and perfect for summer! It looks great with the frayed jeans! I really love your top! I used to not really like fringe bags but more & more I just stare at them & think how cute they are. I am in love with your top! That is seriously so cute! I am obsessing over fringe this summer and pompoms and all that jazz! You look so fantastic loving the shoes too! That is such a fun top!!! But can we talk about how cute those shoes are?!?!?! I love that top. So fun. Ok, can we talk about your hair?? I love it like that. How did you do that? I was thinking of getting bangs for the summer but the humidity scares me. Such a cute top for summer!! I love how your blue heels really pull out the blue in the shirt too! So cute!!! Love, love that top! It's so colorful and unique, it was made for you! And the shoes go perfectly with it. I love the pop of fringe in your bag too...you look stunning! Glad to RAN to retrieve this top from the rack and to take it home with you. Worth all that effort. How fun shopping with your mom for clothes. I can honestly say I have never done that. Not where we were both buying clothes. Maybe when she was still buying MY clothes! Wonder if I could get her to start paying for them again! I've definitely been digging the fringe lately! This is such a fun outfit for the summer! Those wedges are too cute, and I love your tassel necklace! How cute is that top! I've been into fringes lately too! It's the trend of the summer! Love love love the top, so fun and great for summer. Those wedges and pants make it the perfect outfit. Your hair too...you can pull off every style and that is so awesome. You always look stunning! What a FUN look friend! Okay - true story! I just binge read every post of yours that I've missed back to your birthday . . . you've been busy! I've also saved just about every food and cocktail post you've done so there's that! And my daughter and I made the meatball bombs for dinner - they were soooo good! Can't believe you have two boys graduating high school. I feel for you mama! My oldest is going to be a freshman in high school next year and that makes my heart palpitate. Loved the grad posters and prom pics - handsome fellows! I also saved the Mackinac Island post - I've always wanted to go there!!! Your hubby was a trooper for that trip! Finally - you look gorgeous! You're so tan and thin and fashionable. I could pull off fashion posts if I had my 10 year old posing and styling things! Ha! Any who . . . 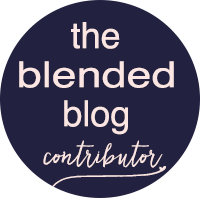 I'm such an off and on blogger depending on what's going on in life . . . I'm so impressed with the quality and consistency of your posts because I know how much time they take! It's a pleasure to know you're "here" and to catch up on your life! This whole look is so lovely on you. That top is such a great find - love everything about it. Perfection from top to bottom! Adorable top! I am loving all things with fringe or tassels! Very nice top, deels like Summer, and your sandals are beautiful. Yes, that IS a cute top! I do love the fringey hem and those shoes are sooo cute! You are looking TAN girl!! That is a fantastic top! It is so cute and I love the colors, not to mention the fringe 💖 Thanks for linking up on Wednesdays Wardrobe. Obsessed with your top!! Loving this look on you! Gorgeous lady!! You look like you are ready for some summer festivals. This is a great outfit on you, but that's not surprising at all. 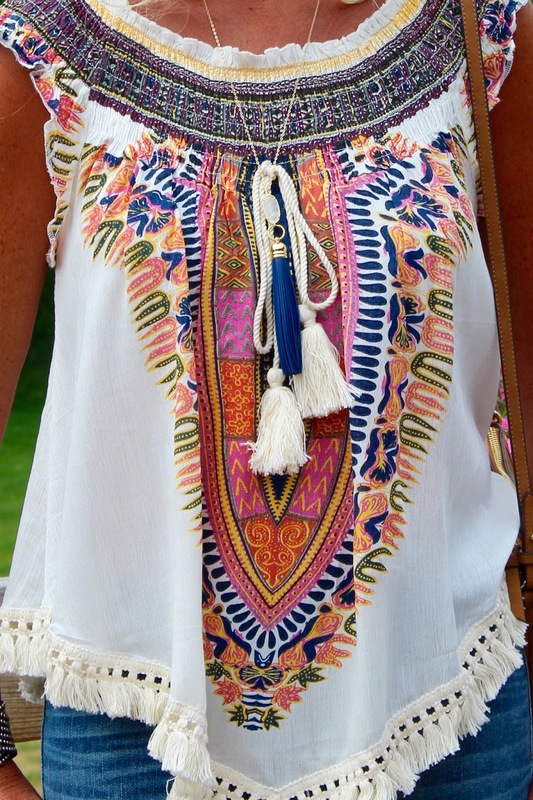 I love that you added your blue tassel necklace along with the top, it looks perfect. Such a fun summer top- love the vibrant print, girlfriend! Andrea, I'm obsessed with this look! I LOVE all the fringe! This whole look is just fab! Also, I need your denim! They look SO good on you! Such a Fabulous top! I can see why you ran to it and claimed it as your own. Perfect with your jeans and fringed bag. This top is so fun! I LOVE the hem on it. Such a fun outfit and perfectly matched pieces! Those jeans are perfect for the fringe top and of course the purse is the perfect accessory to tie it all together. GORGEOUS. 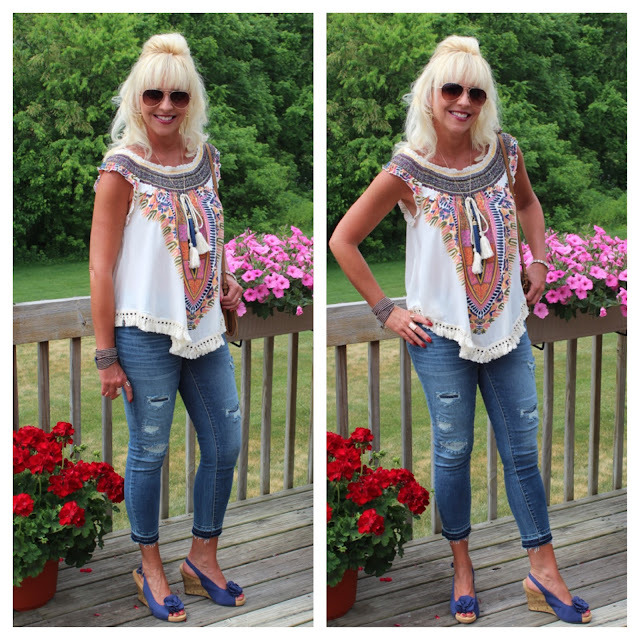 I love that this top combines so many of the hot trends for summer! Can it be worn off the shoulder too? DROOOLING as usual. Such a fun top, Andrea! You styled it perfectly with the distressed jeans and wedges! Looking fabulous! What a cute embroidered top, and I love the tassels too! I enjoy trying things on in beach towns and have bought a couple dresses here and there. Love those blue wedges, looking HOT! Ahhhhh! I love that top and the fringed bottom. You look adorable! Thanks for the maker, I will be hunting that one down. That top is so so so pretty as are the necklace and rosette wedges - both of which match the top beautifully. I will be stalking that brand now hahahhhaa. I have a similar leather suede necklace in gray from Jacket Society. Love this top! The colors & details are amazing! Lovely outfit, I really like your top and wedges.